God’s name is to be hallowed, “set apart”, and treated as special. “We are not to trivialise God,” Bishop Solomon emphasises, and we are to give to Him our “exclusive love”. Therefore, as he discusses in greater depth many of the different elements of worship, such as liturgy, songs, the preaching of the Word, the sacraments, and even the use of technology in worship, he reminds us that “the fear of God is at the heart of true religion and worship”. Our attitude towards worship is thus that we are to have “a deep trembling reverence for God”. He therefore cautions us against the modern world’s feel-good culture, where we feel entitled that all we do has to be enjoyable. Instead, worship is not for entertainment, self-gratification or personal pleasure. The only one Jesus thought of in His ministry, we are reminded, was His Father. We are thus to avoid songs that sound good but are theologically incorrect, some examples of which Bishop Solomon provides. As a collection of 59 very readable essays, each about three to four pages long, with guided questions for reflection at the end of each chapter, this book explores the multifaceted experience of worship, bringing the reader back always to scriptural basics for the heart of worship—God. This book is suitable for pastors, worship leaders and teams, and every worshipper, for we are all called to worship God in spirit and in truth. Sheri Goh is the editor of Methodist Message, the mother of a tween and a toddler, and the willing slave to a cat. 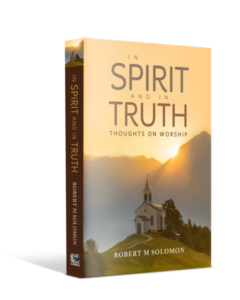 Enjoy 20% off the price of In Spirit and in Truth by using the discount code METHODIST_FEB at the webstore’s checkout page (valid from 1–28 Feb 2019).